Laura and a wild filly we named Lilly. We are living in times where much of society is disproportionately distracted by tabloid headlines about celebrities, while deeds of valour by unsung heroes who live quietly, virtually invisibly among us, often go unknown until their passing. Laura Simpson, pictured in about 1972. Many filmmakers and writers have produced or are working on projects that are about women and horses. And not to take anything whatsoever away from the amazing efforts and accomplishments of women working in the world of wild horse rescue and sanctuary, such stories are not rare. I would submit that there are certainly many stories that would fit into that genera, both true and fictional. This brings me to my best friend and wife of 46 years, Laura Simpson. I don’t think there are too many people among us who upon seeing a terrifying 200-foot wall of flames coming at them and threatening to cut off the only certain escape route, would refuse to evacuate an area when ordered by officials. Laura Simpson did just that; she refused to evacuate Wild Horse Ranch in order to stay with and watch over her beloved wild horses, while also keeping me fed and hydrated as I worked the fire line with the incident commanders as their local knowledge advisor. On July 7, 2018, Sgt. Dan Beck and Lt. MacDonald of CA Fish & Wildlife came to our cabin at Wild Horse Ranch requesting that we immediately evacuate the area. Well before then, the few permanent residents in the area had already fled. Laura told the officers she was not leaving. Laura had explained to me the day before as we studied the fire from the opposite side of lake and our ranch that she was very worried about our local wild horses fleeing and being caught behind locked gates or in some of the old legacy barbed wire left behind by the ranchers back in early days, and we needed to be around checking on them. We discussed the risks and decided to stay. Later that day after I came off the fire-line and after showering the soot and smoke off, I looked out the window to check the progress of the wildfire’s flames, now just a couple of miles distant. On the steps to the cabin just below the window, there was Laura sitting and a wild black stallion named Dutch had his head in her lap, hugging Laura for reassurance as his mares stood nearby. Wild Horses know an Angel when they see one. And clearly, Laura’s presence was already helping. During our five years living among the local free-roaming wild horses, Laura spent much of her time hugging the horses and sharing breath with them. Instead of tending a garden, she tended the Wild Ones. As some people know, when you live in the boonies where there is not much help, if any, and no way out, any oncoming wildfire is made far more serious than in slightly more civilized areas. Heroism comes in many forms and fueled by traits like honor and courage, or sometimes via a mother’s instinct as we see when Jennifer Duncan performed an amazing feat in saving her child. Laura Simpson riding at the Simpson Ranch, in about 1972. Joni Eareckson’s life exemplifies another kind of heroism born of spiritual strength and the tremendous courage it takes to face each day after becoming a quadriplegic. First, we have what I will term as the ‘accidental hero’, who without any prior notice or forethought is suddenly thrust into a situation and reacts in a manner consistent with heroism. Then there is the other kind of hero; someone who rises to meet a challenge. This person knows there is serious danger that could result in death or serious injury. And even with that knowledge upfront and therefore has a chance to flee the danger, this kind of hero does not stand down and instead faces literal death or personal injury to save or protect other innocent sentient beings. Firemen running into burning buildings, police and our military heading into the fray are a few examples are this kind of hero. But they are fully trained, have equipment and some logistical support, which by design helps increase confidence and reduces the risk. View from across Iron Gate Lake as the wildfire approached the Simpson ranch on July 6, 2018. Laura Simpson, a civilian without training or equipment, nevertheless demonstrated this kind of courage and selflessness in the face of the deadly catastrophic Klamathon wildfire, which had already claimed human life, in regard to protecting wild horses. Laura’s motive was simple; pure love. And in the interest of full disclosure, I must confess that even having fought small wildfires before, I was scared of what I saw coming. We had no fireproof suits, no helmets or breathing packs, no fire trucks or high-pressure water hoses. In fact, when I was down on the Camp Creek fire line, one of the Trinity Hotshots saw me and asked; “where’s your Nomex dude”? When I replied that I didn’t have a [flame resistant] Nomex shirt he gave me a used one from the crew truck. This wasn’t the first time Laura showed this kind of courage; in addition to having logged nearly 50,000 miles sailing the ocean and all that comes with that (including spending weeks living on uninhabited desert islands), she was involved in a dangerous search and rescue operation at sea. The Klamathon Fire, which had begun on July 5 in Hornbrook, California was finally contained on the eastern side about a week later at Camp Creek, which generally runs in a north-south direction about one and a half miles west of our ranch. In addition to taking one human life and injuring many others, this deadly wildfire killed scores of wildlife, destroyed habitat and emitted hundreds of tons of toxic hydrocarbon compounds into the atmosphere and polluted the local air mass. But not a single wild horse was lost or injured by the wildfire due to health and welfare checks made possible by Laura’s stand. We both patrolled; Laura keep vigil where horses had congregated near our cabin, and I used my 4-wheeler quad to patrol areas deeper in and along the fire-line. A Cal-Fire ground team notified me of a horse in a corral at a homestead several miles up Camp Creek. They believed it had been loose but was put back in the corral by a member of a penal work crew. I went to the scene and instructed the foreman to make certain the horse was let loose so it could flee the area if the wildfire crossed the fire-line. We also found a soot-covered dog running aimlessly down the trail. I grabbed him and put him into a fire truck where he was taken to safety at the Camp Creek base camp. Wildfire smoke contains a host of toxins that can trigger a myriad of health problems in humans and animals. Laura was also one of the casualties from the smoke, and by early August she had gone from feeling fatigued during the wildfire to experiencing a loss of balance. Our local doctor made a diagnosis of ‘adrenal fatigue’. However, that initial diagnosis proved wrong when Laura became more seriously ill, losing some of her ability to walk. After spending six months in Portland’s best hospitals with a team of top neurologists (including several professors of neurology) treating, testing and retesting, it was determined that Laura is suffering from an autoimmune mediated neurodegenerative disease that is currently unknown and therefore there is no traditional diagnosis. Nevertheless, the doctors suspect Laura’s condition was likely triggered by the wildfire smoke. In just a five-month period Laura had become a quadriplegic as a result of her own antibodies attacking her cerebellum and spinal cord. The doctors are not very hopeful for a positive outcome at this time, as her condition worsens. Laura Simpson with wild mare Rosie. Laura’s form of quadriplegia is the worst since it also affects her brain, and now she is virtually unable to communicate beyond a few simple words; a condition that literally traps a person and their thoughts inside their own head. Through her entire six-month ordeal in the hospitals, I never once saw her cry until I showed her Micah Robin’s short documentary film titled, ‘Fuel, Fire and Wild Horses’ . Just a month before the Klamathon Fire, this new 9-minute documentary was filmed on and around Wild Horse Ranch where we live among the local wild horses. I think it was seeing the wild horses she loved and missed is what set her off. As a sailor and adventurer for most of my life, I have witnessed and experienced some seriously hard times and tragedy; but this is clearly the 100-year storm for me. Short of a miracle, my best friend and wife may not make it to our 47th anniversary in June. 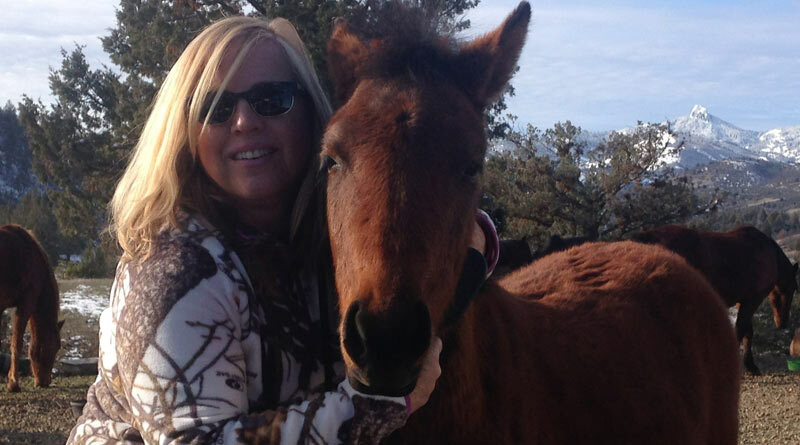 Prayers are needed for Laura Simpson, a true champion for wild horses. Been around animals my whole live, including lots of domestic and wild horses. I have never seen wild horses act the way they do around Laura. Without any doubt, she has an amazing gift, and wild horses just love her; including the most fierce band stallions and bachelors. I recall days when ‘Black Fury’ (we just call him ‘Black’), one of the most fierce stallions I have seen would leave his family in a meadow and follow Laura around the wilderness on her walks like a dog at her side or just behind her. It’s an uncanny thing to experience because I was very protective of Laura. However, after a dozen times or so, I quit worrying and I actually starting thinking he was protecting Laura from the mountain lions on her walks. Like the grey dapple stallion in the video, Black loved Laura like family. And you couldn’t find a more capable protector than Black. (photo’s of Black are at our FB page). So sad to read of Laura’s health struggles. Prayers for your strength, God’s will, healing and medical wisdom for Laura. Angels do walk the earth, and clearly she is one. Her wild horses would certainly attest to that. Blessings to all of you for making a difference.